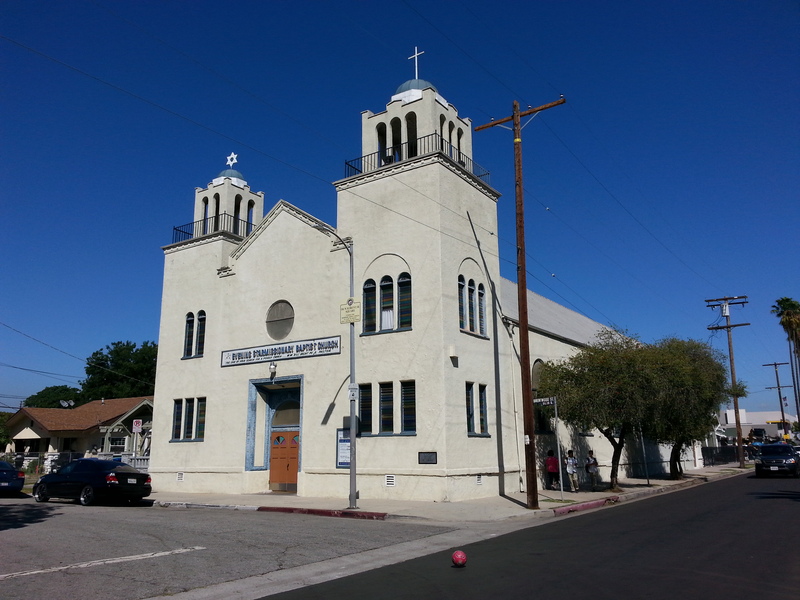 One of the leasts known facts about the community of Boyle Heights, is that until recently it remained a very relevant hub in the daily Jewish life. Up until the past month, our kosher wines and foods used to be mostly distributed from right here in the lower industrial section of the Flats. 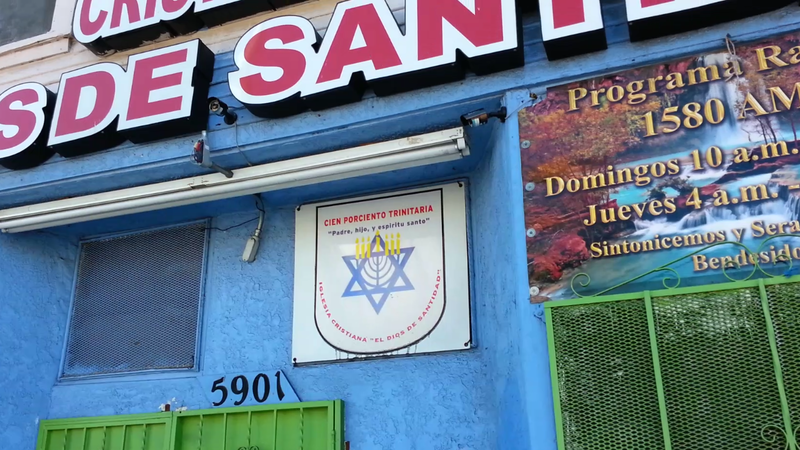 In the shadow of the classic Sixth Street Bridge, sat two special Jewish business. Which were located in the lower industrial section on Anderson Road. Many of our local residents were employed at this plant, doing jobs like peeling the raw garlic for their products. Processing natural products under the supervision of the Orthodox Union. “Shalom & Sons is a family owned full service direct store delivery distributor of kosher and health food products in Los Angeles, California. As a company, we are dedicated to providing outstanding service, while responding to the every day needs of the retail and institutional industries. We currently service the greater Los Angeles area, as well as the cities of Orange County, Santa Barbara County, San Francisco, San Diego, San Jose, Arizona and Las Vegas. Though I had not met the owners of these business until recently, I have appreciated their presence here in the community for years. Their facilities have long sat right along my favorite path I walk towards home. They have been a familiar presence for as long as I can remember. So you can only imagine my shock when I walked by one day and saw the Teva plant entirely demolished and hauled away. Shalom and Son’s Wholesale Foods, Anderson Street. It was just the day after the groundbreaking for the new Sixth Street Viaduct that I noticed the demolition beginning in the area surrounding the footprint of the bridge. Already busy were the sounds of tractors and hauling trucks. Contractors scurrying about. Electrical crews rushing as they redirect the old power cables. In concern I went into the offices of the Shalom and Son’s to inquire of them. 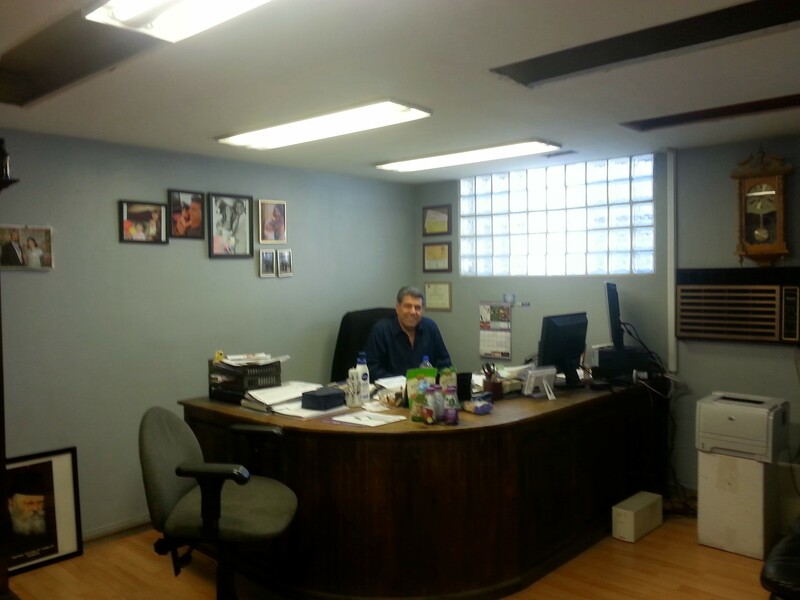 Shalom explained that his business had been in the neighborhood for over 20 year. Growing from a small family business to becoming a major stakeholder in the kosher food and natural food industry at this site. Their operations had take residency on both sides of Anderson Street. Their business offices and cold storage facility, being located at 638 S. Anderson Street. And across from them on the west side of the street at 631 S. Anderson Street, was located their kosher wine storage. “It was only the larger facility across the street that they wanted at first. Over there is where we actually keep the Kedem and all that.” Shalom said. Referring to the special kosher grape juice by brand, a necessary staple for making sacramental blessings over wine. This is something that I totally appreciate hearing about, as kosher wine is very special part of the Jewish tradition. It is a liquid symbol of joy, which is used in every religious celebration and life-cycle event in our tradition. It is also something which requires special care in preparation and handling to maintain its kashrut – meaning it’s ritually appropriate status. This special care taken by Jewish producers and distributors also makes this a premium product of the highest order. “In the end, we also had to get them to buy this building too.” Shalom explains, referring to the small offices and cold storage facility. 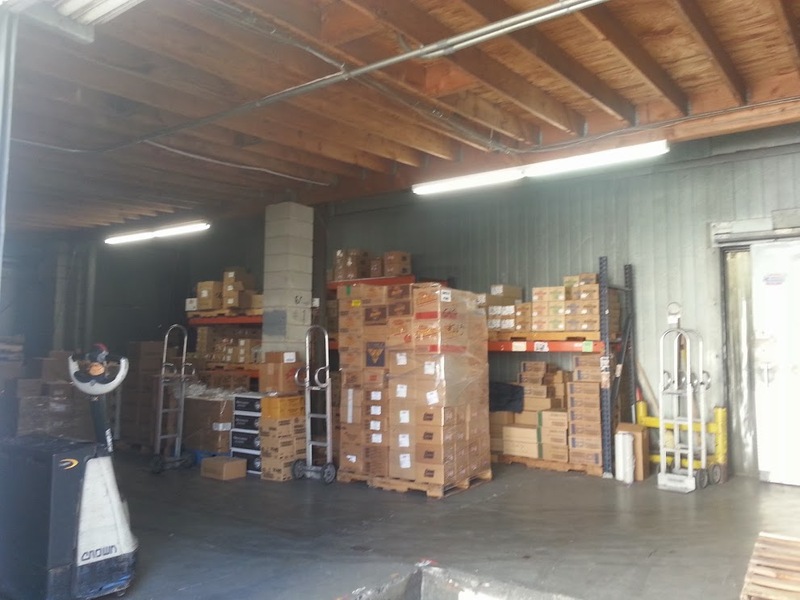 Explaining that without their larger wine storage across the way, the smaller facility could no longer suit the needs of their mainstay business. Their operation was being divided. He explains that with the compensation from the city they are planning on relocating to Vernon with tension in his voice. Like he’s painfully imagining the notorious density and congestion of that area. I had to appreciate his sentiments. He is situated right here in the middle of the East Los Angeles Interchange of freeways, which sends traffic in every direction. Close to every on-ramp. Ideal for a distribution business like his. And also located in a less dense area, here in an almost sleepy underside of the Sixth Street Bridge. As I looked at the amazing view just outside the doorway, I had to share his sentiments. As I was visiting their site the business was in the middle of their biggest rush of the year. Everyone is rushing about their operation. We were just weeks before the Passover holiday. When their products are in highest demand. Wanting to get out of their hair, I asked Shalom if I could snap a photo of him for my historical archives. He smiled for the camera. And I shuffled on my way. This area of the surrounding the Sixth Street Viaduct is going to continue to change dramatically in the weeks to come. As businesses are finished being cleared to make way for the upcoming bridge demolition of the bridge above. The changes are breathtaking. The location of the kosher food and wine facilities: In red are the sites which have already been demolished. The lots where Shalom and Son’s and Teva used to operate will become the storage and processing sites for the rubble from the bridge demolition. 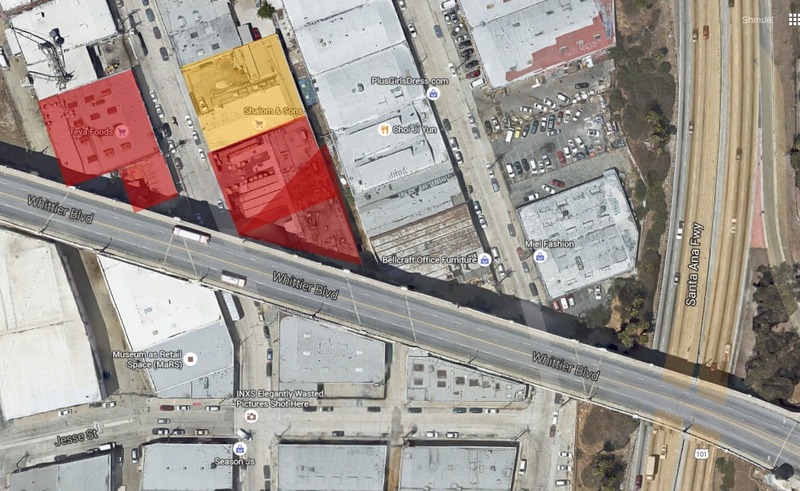 As the city agree to restrict the processing to the Boyle Heights side of the river, and not on the already gentrified downtown Art’s District side. It should also be noted that this is not the only lopsided concession to the downtown Art’s District. which secured an amphitheater and some sort of arts park feature in their area’s redevelopment. In the most typical fashion and according to the way this community has always been treated, the city is taking what it wants for its roads here and is carelessly tossing aside the rest. And so we see right before our eyes, the past revisiting us. As the major Jewish businesses of the area are once again leaving the neighborhood, for no other reason than being displaced by road works. 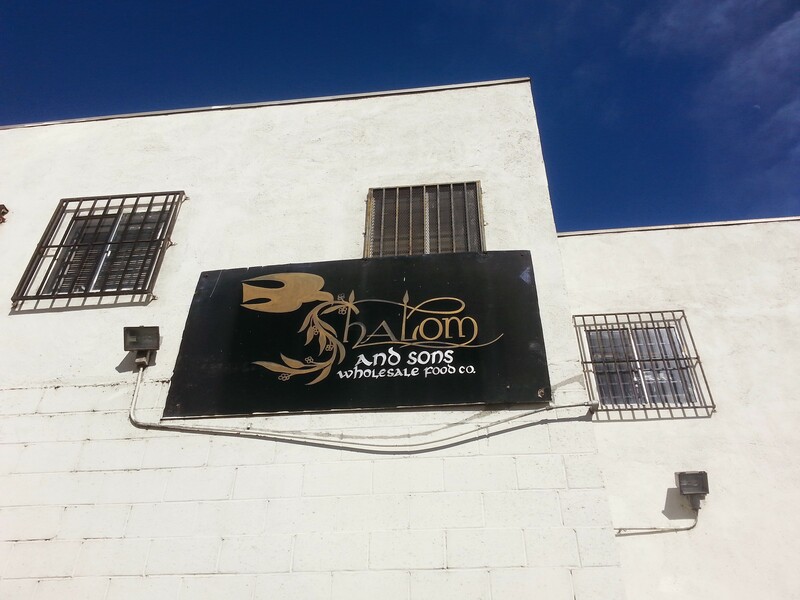 Shalom and Son’s Wholesale Foods, Anderson Street, Boyle Heights Flats. The larger building on the left was their kosher wine facility (now demolished), and on the right is their old offices. 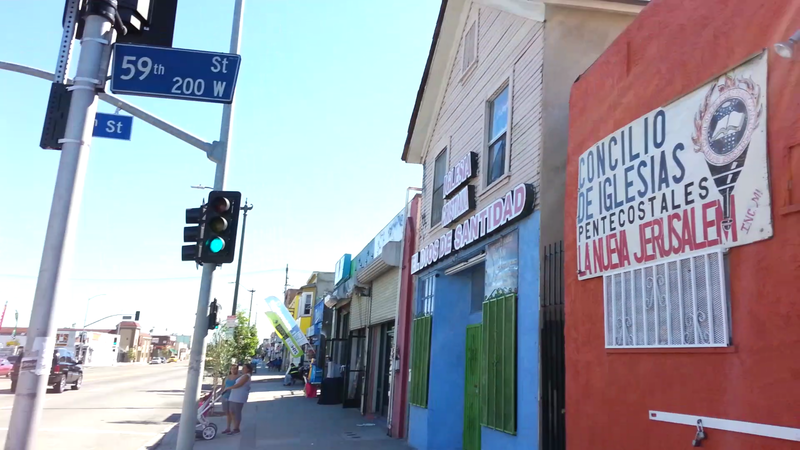 For many years the subject of Boyle Heights had fallen out of the public consciousness. Few people seemed to remember the old neighborhood until recent years. That doesn’t mean there wasn’t a Jewish presence proudly doing business here all along. A neighborhood which is tarnished, if not discounted entirely as less than “kosher” (on many levels) in many people’s minds. I’m really going to miss saying that! Thank you to Shalom and Son’s and Teva Foods. For over twenty-years of service to the Boyle Heights community. Offices on the east side of the street. 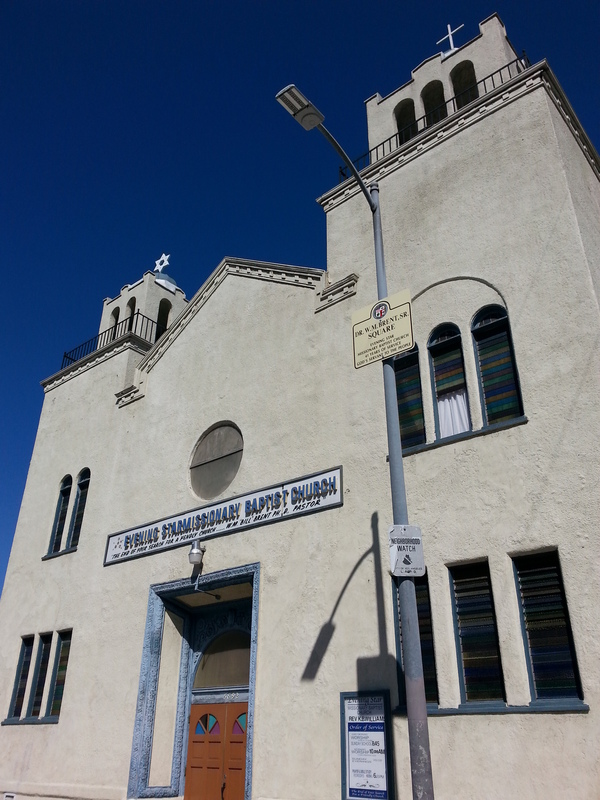 Former Site of Teva Foods Inc.
“Havdalah as a Light to the Community: Reflections and Lessons from the Havdalah Circle of Boyle Heights.“ Sixth Street Bridge. Before I went to the city planning meeting that day, I just had to take one more wide look of this Sixth Street Viaduct. Watching her from the distance of the Seventh Street Bridge, I somberly took in full view of the crumbling Sixth Street Bridge there in the middle of it all. I needed to see the activity and the interconnectivity she provides for this community, just to keep the subject in perspective. The viaducts of the Los Angeles river are an integral part the city, more than many people realize at first. These structures here were created not just to traverse the river, but also to serve as essential corridors for our local freeways. And also for providing passage for all our local commercial and passenger trains; the Amtrak and Metrolink trains, being among them. My personal favorite of them is the Sixth Street Viaduct. Almost everyone in the city commutes over, under and through this structure on a regular basis. And so it has been for as long as any of us remember, that we find our goings and comings from the city greeted by the glory of this bridge and her arches. And this bridge has also become the primary hang-out for my friends and I over the years. A part of our city infrastructure we feel most connected to. Most often taking our spot at the observation point on the north end of the pedestrian walkway. From here we have always watched and reflected upon this great city. It is almost hard for us to imagine the city landscape without her. The historic Sixth Street Viaduct which has graced the city skyline since 1932 has been scheduled for demotion and replacement. As for many years there have been concerns about the structural integrity of the bridge. Indeed, history tells us that within the first 20 years of the bridge being built the concrete of the structure began to suffer terrible damage. The consequences of badly mixed concrete in the construction, utilizing a poor choice of sand aggregate in the mixture. The grains of sand and the concrete-mix having a fatal reaction when repeatedly exposed to water over time, causing the mixture to produce a corrosive gel, as the sand grains swell with moisture. The concrete eventually becoming brittle enough to crack, separate and fall away. A condition called alkali-silica reaction, or “concrete cancer” by the engineers. The bridge is literally crumbling and melting away. This is a serious crisis, for certain. But I’ll tell you the truth: I have never seen anything as broken and damaged as the politics which surrounds the entire rebuilding project for the Sixth Street Viaduct. This has been what I have found most alarming here. Let us consider the project, and all its implications. We are talking about a reconstruction project which when originally proposed it was estimated to cost at around $140-million dollars, which has since morphed and ballooned into over $440-million; a project which is consuming 2/3rds of the entire infrastructure development budget of the City of Los Angeles. And yet for all the money committed, this bridge project remains the most egregious symbol of inequity in the current city redevelopment. Here we are at the start of another building project here which is wrong from the beginning. With the current failures of this project reflecting the deafness of both the civic and neighborhood council leaders. This all clearly demonstrating the complete failure on the part of our local leaders across the board to advocate for the needs our disadvantaged community which is most effected by this project; the neighborhood of Boyle Heights. So here I gathered my thoughts here for a few moments. And then finally walked my way from the viaduct and over to the local magnet school which was hosting the community forum for the Sixth Street Viaduct Replacement Project. A much-anticipated update from the city and the contractors, regarding the demolition and rebuilding. And as I walk up to the entrance I run into the Los Angeles City Council member for this district, Jose Huizar. We pass with barely a pleasantry, greeting and parting abruptly. Actually I think the same can be said for his appearance at this meeting in general. His very presence at the community forum was short and abrupt. Excusing himself for another hearing after a few short words, and conveniently not having to be present to answer for any of the community concerns regarding the project. As the community members began to pile in to a room mostly filled with suits and contractors, we also joined them; my local companions and I. This was not our first time at the rodeo, but even we were shocked by the fruitlessness of this forum. Huizar came with his usual attempt at charm and carefully expressed sympathy over the loss of this iconic bridge, though in the end all he did was do political nodding and offered little of substance. He had a few nice things to say which I appreciated, about developing the art of the space and reusing materials from the historic bridge. The latter of which I believe is the most sincere. What I found troubling was one of his last and briefest points to address, regarding the redevelopment of the underside of the bridge. In which he credits his office with securing $1-million for the construction of a “soccer park” on the cleared land underneath the bridge. As he mentioned this my eyes were drawn to the diagrams and maps, to take notice how the businesses in the Boyle Heights Flats are effected. Only to notice many cleared away in the new renderings. I know the area very well. And every single business which they are replacing with just grass there in their diagrams. Now how is that a community organizer like myself, in a Latino community, is opposed to this? My opposition is to a clearly mindless form of ethnic pandering here. And my scorn is for the cheap and token redevelopment feature aimed to pacify Latino objection to a highly unpopular redevelopment project. A typical move which is not just cynical, but also inequitable. What completely amazed me was that just a year before at similar public briefing and forum hosted by Huizar’s office the city had warmed us all over with emphasizing that the bridge was to be transformed into a destination on both banks, with active artistic and cultural components. Stating that this all needed to be equitable and integral to the space, so as not to feel like an afterthought. [Citation: See video of the December 11, 2013 meeting; citing Felicia Filer, Department of Cultural Affair. My favorite part is this, “There are so many different areas on the project in which public art happen. Where art can happen and future art programming. We wanted to look at the project holistically and cohesively, so that wherever opportunities are they tie together, so that it feels like a plan and not an afterthought.” Felicia Filer, Department of Cultural Affairs. I would say we are all in agreement with her, which is why it is shocking they have in the end planned nothing significant in terms of integrated programmable artistic and cultural space on the eastern side of the bridge.]. However, now what we had being presented to us was far less than carefully balanced. A revelation that would further be compounded as the city planners and engineers unveiled the model and animations for the new Sixth Street Viaduct. Complete with an amphitheater and an “arts park” to be constructed on the now gentrified Art District side of the bridge, on the western bank of the Los Angeles River. While as for their plans for under the much larger Boyle Heights span, so far all they had to show for was an afterthought of a soccer field feature being represented by a piece of green construction paper under their model of the eastern span of the bridge; in the struggling minority community on the other end. The viaduct of today is just about 2/3 of a mile long; 3500′ of bridge, with 400′ of twin double steel arches spanning over the river where the bridge slightly curves southwest as it extends towards downtown LA. The painted bluish-gray arches standing 40′ high, are the most beloved accent of the bridge. The old bridge was designed at the height of the Art Deco era. The design shows both Art Deco and streamline Moderne themes, the first bridge of it’s kind. Indeed each of the bridges have a unique theme to them. Some of them neo-Classical like the First Street Bridge, and others are Gothic Revival like the nearby Fourth Street Bridge. All of them made to play off of and accentuate each other. This motif has great historical significance to us locals, in providing functional and yet comfortingly classic atmosphere to our area. For these reasons, the Sixth Street Viaduct is designated as Historic-Cultural Monument #905 by the California Register of Historical Resources. The bridge of the future is tremendously different. As the civil engineers spoke, we all stared eagerly at the scale model which took up the whole auditorium. This new design being a great departure from the current architectural theme of the area, and also from the previous design plans. Almost nothing of the original bridge and charms were retained, except for an embellished stream of integrated arches designed to span nearly the full length of the bridge. There is no doubt that the new bridge design is bold and breathtaking. However, it is more stupefying when we see that they have diminished the historical integrity of the surrounding area in ways which appears to push a wave of sweeping redevelopment and character changes upon this area. Considering all the other options for the rebuild, this most certainly is the best design. Early on in the design planning for the new viaduct, reproductions of the bridge were considered. Reproductions of the old bridge without any arches, a lackluster redesign which would have done no justice to the original Sixth Street Bridge. This bridge design as least incorporates an homage to the original arches. Which is quite meritorious. And the bridge also does comes with some impressive features. The new Sixth Street Viaduct is designed to have protected bike lanes and paths. As well as a safer pedestrian walkways, secured by dividers. And circling bicycle ramps which promise easy acceptability. As the presentation continues, we hear of how the “Ribbon of Light” theme for the bridge will incorporate embedded LED lighting. State of the art lights which can be changed in color in order to enhance the bridge, thematically or according to artistic tone. Mood light streaming along the face of the bridge and walkways. An admittedly expensive, but beautifying feature integrated into the bridge. Most impressive though are the integrated artistic and cultural space planned for much smaller, western span of the bridge; on the Arts District Side. The amphitheater which will meet up against the entrance to the service tunnel of the Los Angeles River. Re-envisioning the almost urban cathedral nature of the underside of the bridge there as a programmable space. With an arts park which also planned for the adjacent areas. These type of features are not by accident. 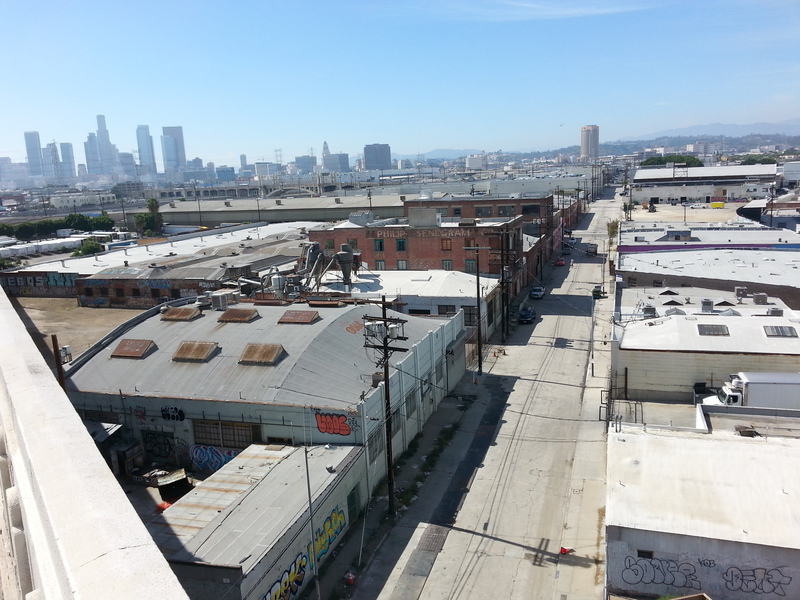 Indeed early on in the process of the redesign the now gentrified Los Angeles Art’s District had demanded a percentage – I believe at one point they wanted as much as 4% of the redevelopment money – in order to apply to artistic redevelopment of their area. In the end, some effective advocacy for their community resulted in the incorporation of these grand features, the amphitheater and arts park. The green construction paper signifies the after-thought soccer field feature. What I find starkly contrasting is that for all of this light and programmable space being planned here, the only thing that this massive model has presented for the Boyle Heights side of bridge – for the 2500-feet which makes up over 2/3rds of the length of the bridge – is a piece of green construction paper on the underside of the bridge just west of Anderson St. An ad-hoc representation of their trite afterthought of a soccer field. This green piece of paper being just as barren and honest as the reality of that plan, just an empty green space left on the dark underside of their bridge. For the first time I really felt the full effect of the dissonance which the community members around me also felt in the face all this. Even I began to feel the tension. The civic planners have made great use of space in their designs for artistic expression in the gentrified side of town. And it makes great concessions to the newly arriving yuppies who need to feel that their own contrived being is in itself artisanal, who see their very privileged lives as performance art. But what about for the genuinely culture rich Boyle Heights? What for the side which has a well established historical tradition of folk and applied arts? The east side – which has great historical significance for it’s rich ethnic and cultural character – what did we get for tangible programmable arts space? Gornisht mit gornisht… un montón de nada… a lot of nothing.